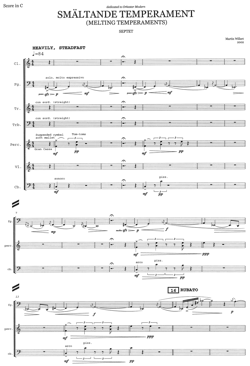 SMÄLTANDE TEMPERAMENT was composed during the spring of 2002 for the ensemble Orkester Modern. The title comes from the ancient theory of the four different temperaments (melancholia, sanguinism, phlegmatism and cholerism). I have used this idea in a broad sense. The music presents different stereotype temperaments or characters. These characters color each other, gradually melt together, and create a more many-facetted and complete image (personality). The work was premiered by Orkester Modern at my graduation concert in May 2002.